marQaha is an infused Cannabis product company from Denver, CO. They specialize in making infused Cannabis drinks, tinctures, sublingual sprays, and edibles, the drinks being the most impressive product they offer. Today, I will be reviewing the Lemonade-Black Tea, a Sativa drink, also known as One-Eye Open. The Lemonade-Black Tea is a part of the Inkblot Series, a line of infused Cannabis beverages that all have 110mg THC. This one is a Sativa based drink, used for daytime use. This is definitely my favorite Cannabis infused beverage. It pretty much tastes like an Arnold Palmer, with a slight hint of Cannabis, but it mixes well with the Tea. It is very refreshing, with uplifting, energizing, and euphoric effects. I would recommend drinking one of these when you have something to do, as it will keep you alert and keep your mind sharp. Since it is a liquid, it doesn’t need to be digested before it hits your blood stream, so it hits you very quickly. This is a great product for the more health-conscious Cannabis user, as it is all natural, gluten-free, vegan, and low glycemic. 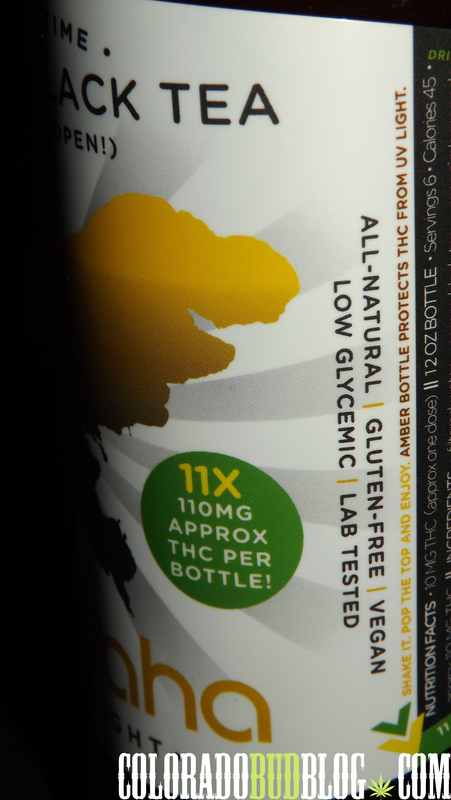 It is also lab tested at 110mg THC. One of my favorite things about marQaha is that they only use all-natural ingredients. When I spend over $10 on a Cannabis drink, I want it to be real, and marQaha delivers that. While other companies use artificial colors and flavors, and load their drinks with sugar, marQaha keeps it simple, with literally only 5 all-natural ingredients, and I love that. I would recommend this drink to anyone who wants a great tasting and effective Cannabis infused drink. I think everyone should give these a try. They will have you bouncing off the walls with energy, as well as having some very deep thoughts. 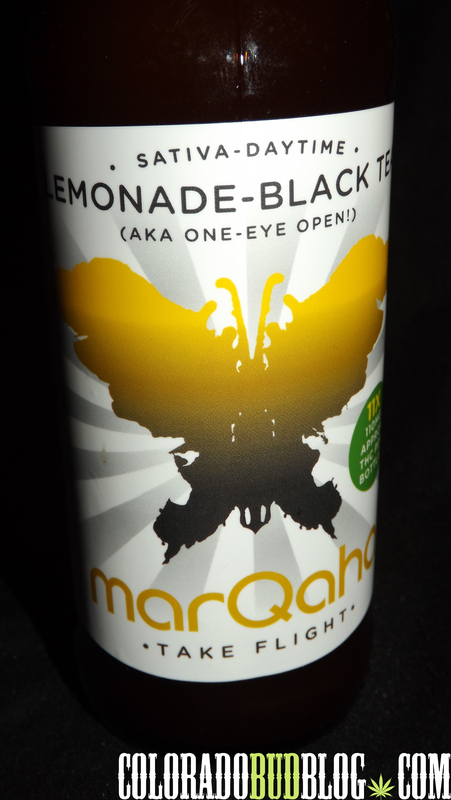 Pick up a Lemonade-Black Tea from marQaha at your local dispensary, and check out more products from them at http://www.marqaha.com! 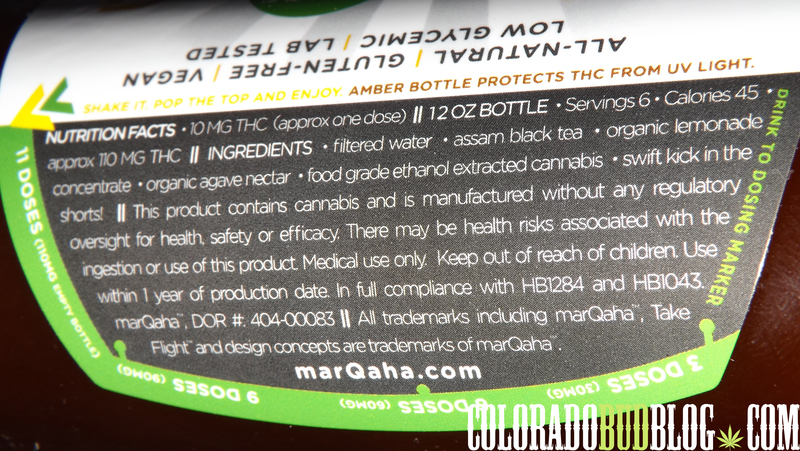 This entry was posted in Colorado, Infused Drink, marQaha, Sativa and tagged Infused Drink, marQaha, Sativa. Bookmark the permalink.